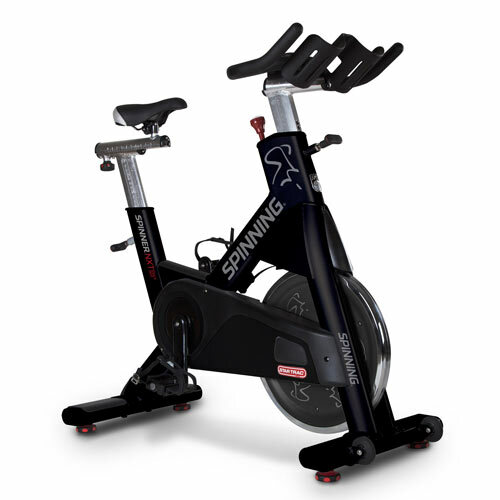 Spinning ®, the indoor cycling experts, have launched an exciting new stationary bike that marks a significant change for the company and the direction of the indoor cycling market. Until now, Spinning ® machines have always been chain driven to replicate the dynamics of a real road bike as closely as possible. However the Black Belt NXT has been engineered with a super smooth belt drive system that dispels the myths that surround this type of machine due to common issues with more budget belt driven machines. Here at Origin Fitness we’re big advocates of the Spinning ® programme and Star Trac’s bikes, so naturally we couldn’t wait to put this new technology through its paces. 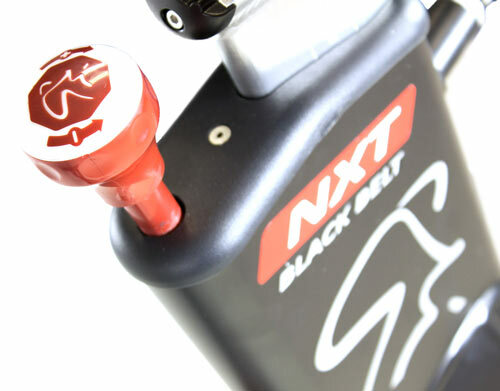 The bike frame is much the same as those of our best selling commercial spin bike, the NXT. It features a narrow Q factor of 158mm but a heavier 18.6kg perimeter weighted flywheel which gives the bike a realistic riding feel similar to that of a road bike. We opted to use the SPD pedal option to keep our feet fastened to the pedals while riding but you can easily use the toe cage to the same effect. The bikes fore and aft handlebar and seat adjustment options meant we were able to set the bike up perfectly to match our riding profile. The Black Belt looks like a great bike as well as riding like one. The black rust-defying two layer powder coated paint job is very stylish and gives it a really smooth clean finish. The most exciting thing about the Black Belt is obviously the belt itself. This Kevlar Poly-V belt makes the Spinner ® NXT Black Belt a virtually silent indoor cycle, certainly the quietest commercial high-spec indoor cycle that we’ve ever tested. 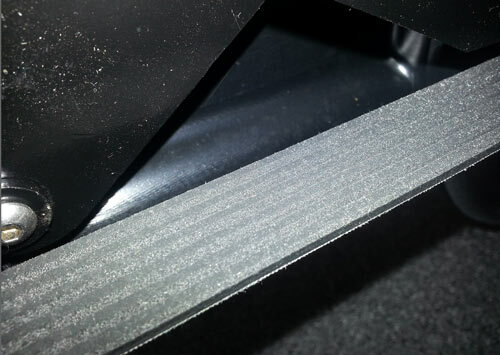 The Poly-V shape, often used in manufacturing and industrial engines, gives the NXT an increased level of power transmission while still using a belt of the same width. We imagine that this increase in power transmission is why Star Trac has decided to increase the flywheel weight from the previously optimal 17.2kg to 18.6kg. Despite the unbelievably smooth ride and quiet mechanics this bike still feels like the classic Spinner ® NXT. The one concern we had with Spinning opting for the Poly-V belt design with longitudinal rather than a toothed design like Schwinn’s Carbon Blue was that it might be more likely to slip and loose tension. Once we had examined and tried the bike though, we realised this wasn’t the case. It is nearly impossible to get the heavy flywheel to slip for two main reasons firstly that the Kevlar belt is particularly strong, so isn’t likely to loosen over time but also because it runs over a small idler roller which can be raised or lowered to increase or decrease the length of the belt path and therefore belt tension. 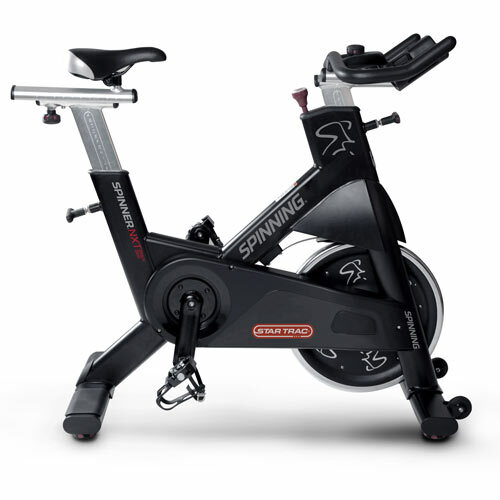 At first, we weren’t sure we would be, but we’re definitely big fans of this belt driven version of the NXT, our best selling Spinning ® Bike. The smooth and silent ride is like no indoor cycle we’ve ridden before and is probably quieter than any road bike we’ve ridden as well! This bike would be perfect in a gym where noise can be an issue or in a flat where you’re conscious of not keeping the neighbours awake with the sound of late night training sessions. Don’t let the fact that it’s “belt driven” put you off, because actually that’s what is so brilliant about it. This entry was posted in Knowledge & Advice, Product Reviews on 13th July, 2014 by Colin Evans.